Gold and silver futures maintained gains that began in later trade Wednesday following a dovish-taken Fed policy statement. Both metals ended at more than one-week highs. Gold for April delivery added $5.60, or 0.4%, to settle at $1,307.30 an ounce on the Comex division of the New York Mercantile Exchange. The settlement was the strongest since a week ago Wednesday, March 13. "The accommodative stance by the Fed and dovish shift in rate hike expectations is bullish for gold as interest rates declined across the board" Wednesday, MarketWatch quoted Tyler Richey, co-editor of the Sevens Report. "This adds to the recent trend of declining real rates and that is decidedly positive for gold." "It’s becoming increasingly likely that gold will test multi-year highs in the mid-$1,300s again in the coming weeks," he added. 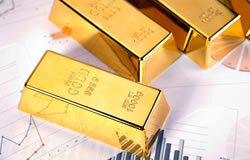 Gold futures ranged from a low of $1,302.80 to a high of $1,320.20. They slipped 0.4% on Wednesday, climbed 0.4% on Tuesday, and dipped 0.1% on Monday. Silver for May delivery tacked on 11.9 cents, or 0.8%, to close at $15.437 an ounce. The finish was also silver’s highest since March 13. Silver futures traded between $15.38 and $15.65. They lost 0.4% on Wednesday, gained 0.3% on Tuesday, and shed less than a half cent on Monday. April platinum edged up $1.50, or 0.2%, to $861.10 an ounce, ranging from $858 to $876.70. Palladium for June delivery declined $2.50, or 0.2%, to $1,557.90 an ounce, trading between $1,550 and $1,576.90. On Wednesday, the metal scored its third straight record settlement. Gold rose $5.90, or 0.5%, to $1,309.60 an ounce. Silver added 22 cents, or 1.4%, to $15.54 an ounce. United States Mint bullion sales advanced with increases of 500 ounces in American Platinum Eagles and a combined 1,000 ounces in American Gold Eagles. Below is a sales breakdown of U.S. Mint bullion products with columns listing the number of coins sold during varying periods.